A printed Look, Listen & Live lesson book series is available for South Africa only. Order here from GRN Southern Africa. The 'Look Listen & Live' flipcharts, the 'Good News' flipchart or alternatively the Bible Picture Pack, are an invaluable aide to those working in children's ministries. 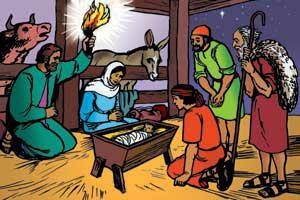 We have developed lesson plans to accompany the 'Good News' and all eight of the 'Look Listen & Live' books. These lesson plans are free to download. Click on the links below to view or download the required plans. The 'Good News' lesson plans help in teaching a quick Bible overview from Creation to Christ's resurrection and then the basics of the Christian Life. The entire series of 8 'Look Listen & Live' lesson plans help in teaching the LLL stories that encompass Genesis through to the early New Testament Church and Paul. 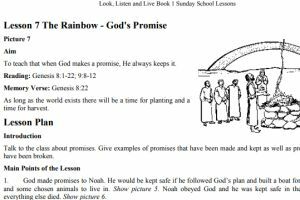 The Sunday School lesson plans give structure and purpose to each lesson but also gives scope for teacher or leader to incorporate their own activities related to the memory verse or theme, if they wish. Each lesson plan has a clear aim which is outlined at the beginning of each lesson and sustained throughout the lesson. 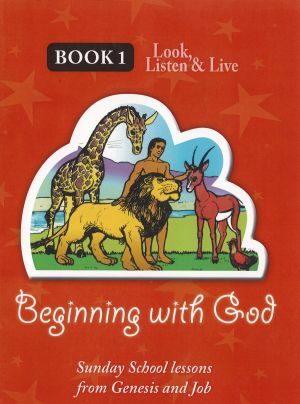 Each lesson's scripture reading provides a sound biblical foundation for the teaching material. A memory verse encourages children to commit scripture to memory. The 'Starting Point' section provides a way into the material, a child friendly activity or discussion question to provoke thought and stimulate responses and interest. 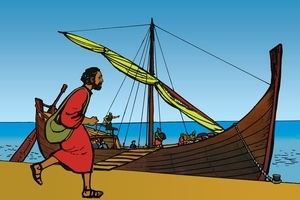 The main content is in the section 'Main Points of Today's Teaching' which outlines the Bible story in language that is easy for children to understand and includes references to the scripture passage as well as clear prompts as to which picture in the flipchart relates to that particular segment. 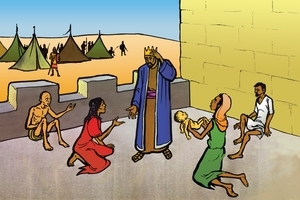 The flipcharts provide visual stimulus to maintain children's interest while they listen to the Bible story and learn the Bible verse. The final section 'Our Response to the Story' consolidates what the children have learnt in the lesson most commonly in the form of a summary and answer/response activity. "I think every Sunday school teacher is looking for a study that will not only teach basic biblical truths but is also enjoyable and fun to teach. I found all of this in the study 'Beginning With God'. The Old Testament isn't always the easiest part of the Bible to explain. But this study starting right from the beginning in Genesis revealed fundamental biblical truths in an easy to understand way for children aged seven to eleven. The simple truth that God is the creator of the universe was understood and celebrated within the study. The children loved the large pictures. The bright colours and clear illustrations drew the children's attention into the picture and therefore into the story itself. The study asked the children to name the animals in the picture which had everyone participating. All the children said Giraffe because the illustration was so bright and appealing that was clearly what everyone saw first. By the end all could recite the memory verse which gave them the message. The prayer time allowed the children time to reflect on and appreciate the wonderful world God has made for us all." How to order all our audio-visual materials - Flip charts, booklets, CDs, etc. Audio and Audio-Visual Materials - Choose from our wide range of culturally appropriate resources in over 6,000 languages, particularly suited for oral communicators.